Aircraft watching, like the bird watching is a a hobby of many. No sooner, the plane watchers start to hear the voice of an aircraft they start to search it all around. But sometimes, plane watching can become an awesome experience of lifetime. 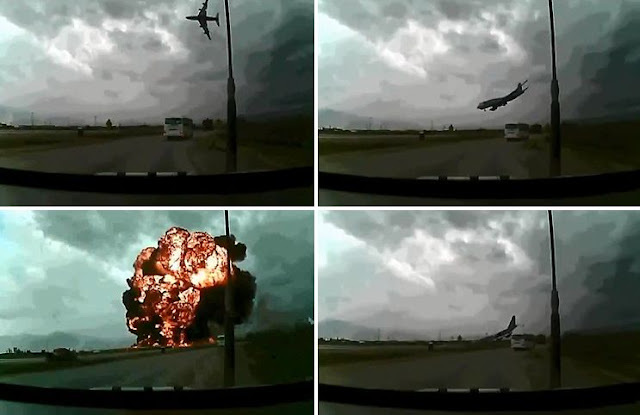 A horrifying dash-cam video captured a terrifying moment in Afghanistan near the Bagram air base near Kabul, which shows a cargo plane, a Boeing 747, appears from the sky ad then violently crashes right in front of the eyes of the occupants of a vehicle. The cargo plane bound for carrying seven American crew members perished alongwith its crew in a huge fireball that consumed almost the whole aircraft. The aircraft belonged to a private company National Air Cargo.